SHIELDON 225 fabric has the composition of 75% cotton and 24% polyester and 1% metal fibers. It can reduce 80% of the RF(Radio Frequency)/MW(Microwave) EMF/EMR(Electromagnetic Fields/Electromagnetic Radiation) level in frequencies between 10MHz and 5.4GHz. 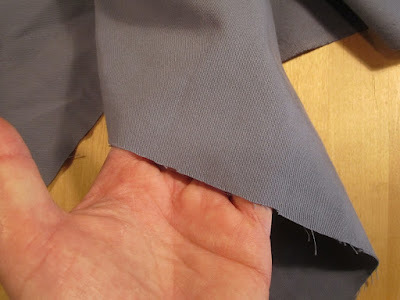 The fabric does not block ELF magnetic fields from electric cabinets/equipment and power lines). It weights 225 gr/m2 and It is currently available in Navy blue color. Can block about 80% of RF in frequencies between 10MHz to 5.4GHz. Option 2 - buy now! Chose the number of items you want to buy. Fill in the "Contact Us Form" (see below) and we will get back to you with more details and a price quote. When all info will be complete, we will send you a PayPal request(invoice). If not in stock, items will be ordered from manufacturer ASAP after payment. Items will be sent to your adders as soon as they arrive. If you are 100% sure of the items you want and want to buy it now use the button on the upper part of this page to order.